Life on Fraser Island: Cool Dingo Tour: Antonina and Tahlia's East Coast Adventure Cool Dingo-style! Cool Dingo Tour: Antonina and Tahlia's East Coast Adventure Cool Dingo-style! Gorgeous Lake McKenzie is stunning all year round! On Thursday we went to Fraser Island on a 2 Day Tour with Cool Dingo Tours. We were picked up from our YHA hostel and then taken to the port to catch the ferry across to the famous Fraser Island. We were met at Fraser Island by our tour guide Craig and the rest of our tour group. We were a small group of 10 young independent travelers. Craig gave us a run down of what we were going to be seeing and doing for the day and we jumped on our 4X4 bus to make our way to our first stop, the stunning Lake McKenzie. The roads were steep and bumpy which made the drive so much more fun! Once we arrived, we had morning tea and time to swim in the lake and relax on the beautiful white sands. Lake McKenzie is breathtaking and looks just as it does in postcards! We then enjoyed a lovely picnic lunch as a group and everyone began to mingle and chat about their travel experiences so far. We had an awesome tour group of friendly people from different parts of the world. Throughout the day we made many stops. We visited Basin Lake and Wanggoolba Creek and took relaxing walks through sub-tropical rainforests. It was then time to head down to the Jetty Hut to watch the spectacular sunset. We then headed back to our resort. Kingfisher Bay Resort provides really nice lodge accommodation. Travellers have the option of quad or double rooms. The resort has fantastic facilities such as a large pool and Jacuzzi! At 6:30 we met the rest of our group at the Dingo Bar for dinner. Tonight was pizza and pasta night! It was a huge buffet dinner for all to enjoy! The food was delicious! Some people even went for third plates! At 8:30 Happy hour started and so we all had a few drinks as a group and continued to chat about our travel experiences so far. This brought us to the end of our first day. Flat out like a... dingo... sleeping! We started our day with a huge buffet breakfast down at the dingo bar before jumping back on our 4X4 bus. The day was spent checking out several more of the hot spots on Fraser Island such as The Pinnacles of Coloured Sands, The Maheno Shipwreck and The Champagne Pools! We even got to see whales and dolphins at Indian Head!! It was so exciting but you had to keep your eyes open because they weren’t very easy to spot. Another highlight of the day was seeing some dingoes! This tour was fantastic and having such a small group allowed us to stop for longer at certain places and we even go to check out some places that weren’t in the itinerary. We couldn’t have been happier with our tour guide! He made the tour fun and constantly kept us entertained with all his interesting facts about the island. 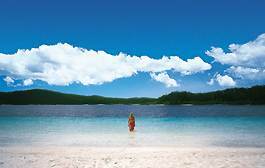 There is so much to see on Fraser Island and Cool Dingo Tours gave us the opportunity to see pretty much all of it. We had an absolute blast and can’t wait to go back again some day!